Beautiful Designer carpet, it is woven in pure New Zealand wool and cotton. It contains Persian design pattern and also called Persian carpet. The ground of the carpet contains a diamond shape with tiny patterns. Kashmir Kashan Kali carpet is a pure Persian carpet which gives a Kashmiri look in Kashan design pattern. Kashan design has been originated from Persia which is the hub of traditional carpet. This is totally hand-woven in Pure New Zealand wool and cotton material. 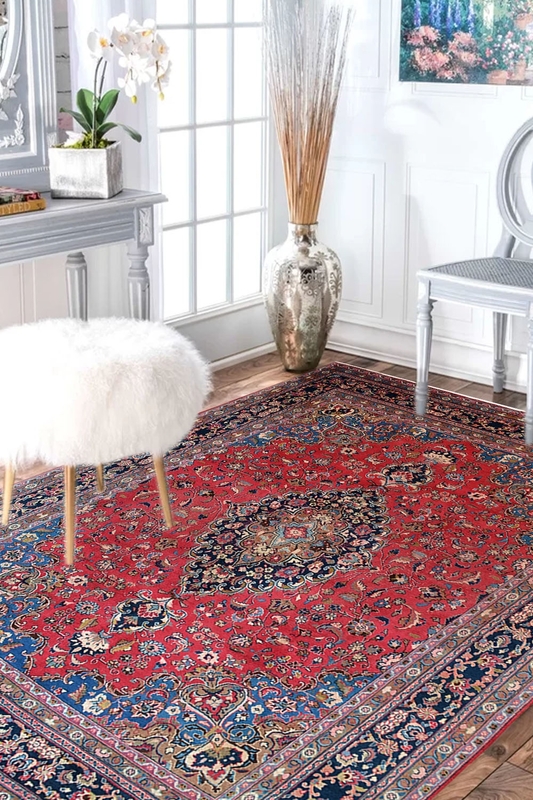 The stunning combination of Vibrant colors like Navy blue, sky blue, red and the world-class quality material (Pure New Zealand wool) make this rug a true representative of what Indian rugs are known for.